Carnival is a traditional festive season that occurs in the weeks leading up to the Lenten season, often culminating on the day before Ash Wednesday, the beginning of the Lenten period. (The word Carnival comes from the Latin for "farewell to meat," as many people mark the Lenten season by abstaining.) Celebrated throughout the transatlantic world, Carnival is perhaps most popular in New Orleans, Brazil, Trinidad and Tobago, and other islands in the Caribbean. It dates back to enslaved people on French plantations in the Caribbean in the 1800s who celebrated “Playing Mas”—or masquerade—as part of a beloved pre-Lenten tradition. Today, in many Caribbean communities, the socially liberating celebration of Carnival is a national obsession, with participants spending the better part of the year in preparation for this multiday celebration. Carnival costume maker Kenley “Shortmus” John hails from the island of St. Vincent, situated between St. Lucia and Grenada in the Caribbean Sea. After moving to Baltimore, he founded Shortmus Productions, a performing arts group that constructs more than 100 costumes from scratch each year for Caribbean-style carnival celebrations across the country, including the annual CaribeFest in Virginia Beach. "My costumes symbolize the beauty of life in the tropics," says John in an interview with the Baltimore Sun. "My costumes are an expression of ... our cultural heritage. It tells the story of who we are and where we're from." Another distinct aspect of Carnival celebrations are stilt walkers, sometimes called “Mocko Jumbie” or “Moko Jumbies.” Writer Katherine Brooks explains: “The term ‘moko jumbies’ combines what many have interpreted as a name for an African deity, Moko, and the West Indian word for ‘spirit,’ jumbie. Taken together, the two concepts have amounted to a centuries-old art form consisting of extravagant costumery and gravity-defying dance, in which individuals mime the movements of a towering, protective god.” Baltimorean Shacomba Phipps is a stilt walker whose grandfather brought the tradition from Nigeria to the island of St. Thomas. Phipps and his crew perform on 13-foot stilts, cavorting as spirits who strike fear into the hearts of evil-doers. The tsam is a Buddhist ritual performed by dancers wearing elaborate costumes and masks. It was introduced to Mongolia in the eighth century, when the Indian saint Lovon Badamjunai sanctified the first Tibetan Buddhist temple. The tsam is a secret and subtle ritual, the meaning of which is often known only to those who perform it. In the 1930s, the Communist government in Mongolia banned the tsam, along with other religious displays. It has since been revived by a number of Mongolian artists, particularly Gankhuyag “Ganna” Natsag, a mask maker and visual artist who was born in Ulaanbaatar. Ganna's parents, famous masters of traditional Mongolian handcrafts, introduced him at an early age to the fine art of making dance masks for the tsam. He now lives in Arlington, where he helps to keep the tsam tradition alive in the city’s growing Mongolian community. Ganna is a prolific artist whose ritual masks and costumes have been exhibited all over the world. He recently helped curate the exhibition Genghis Khan: Bring the Legend to Life at the Franklin Institute in Philadelphia. Ganna dreams of creating a World Peace Pagoda in Mongolia and met with the Dalai Lama in 2014 to receive his support for the project. He has passed on the tradition of mask making and the accompanying dance to his children, Zanabazar and Maral Gankhuyag. Washington Post article: Could a mask maker’s quest to see the Dalai Lama bring about world peace? In the years between 1975 and 1979, the Maoist-inspired radical group, the Khmer Rouge, committed horrific acts of genocide in Cambodia, attempting to collectivize Khmer socioeconomic operations, destroy the traditional family unit, and outlaw local religious practices. The Khmer Rouge also targeted the Khmer’s traditional arts and culture. Among those artistic expressions most targeted was the remarkable tradition of Cambodian costumed dance and opera. Khmer classical dance can be traced to the Angkor Empire (802-1432 AD). The dance postures and costumes that comprise contemporary practice have their roots in images of dancers carved on ancient temples, and are modeled after traditional Angkorean dress. Perhaps the most dazzling elements of the dance costumes are the crowns. Male and female character crowns are multi-tiered spires that resemble the top of Buddhist shrines symbolizing Mount Meru, the center of the Buddhist universe. They are adorned with jewels and rosettes on springs that sparkle with the slightest head movement. Wings surround the ears and a crescent-shaped diadem, framing the face, distinguishes female from male crowns. Sochietah Ung migrated to Washington, D.C., in 1979, and soon made contact with a Virginia-based dance troupe led by master teachers Phuong Phan, Moly Sam, and Sam-Ouen Tes. They intended to perform a Cambodian opera story and, remembering that Ung’s grandfather had been an opera singer in Cambodia, they asked him for help in making the costumes. Thus began his career as a Cambodian costume, crown, and mask maker. Ung’s costumes became highly valued in both the United States and Cambodia, including by Princess Norodom Buppha Devi, the premiere dancer of Cambodia’s Royal Dance Troupe during the 1960s. While on tour in the U.S. in 1985, she wore one of Ung’s crowns and told him, “You have fate. You were born to do this job.” Ung is dedicated to teaching his costuming craft, as well as traditional dance, to students young and old, within and outside the Cambodian community. For communities on Virginia’s Northern Neck and Middle Peninsula, the oyster fishery was perhaps the largest and most influential industry from the mid-1800s to the mid-1900s. Men and women employed by the industry worked a variety of jobs, from boat cook, captain, and crew, to shore-based scow gangs and shuckers. Shucking in particular provided many employment opportunities for African Americans throughout the Chesapeake region. 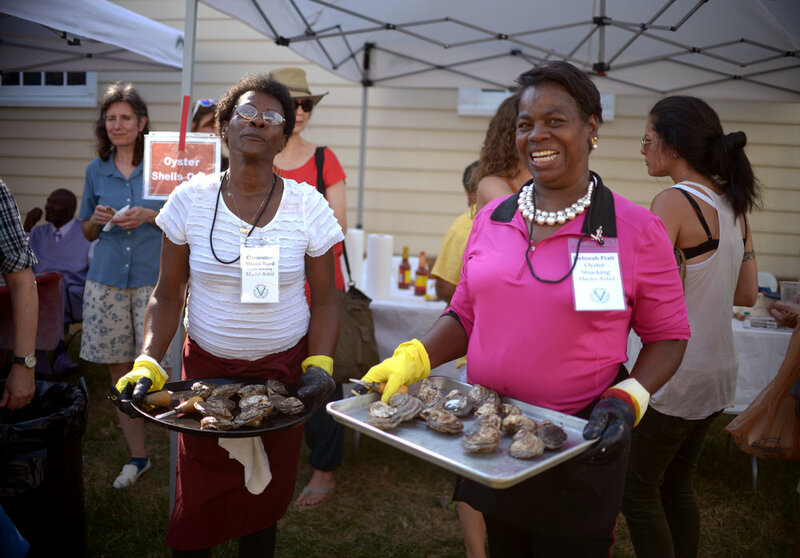 Sisters Deborah Pratt and Clementine Macon Boyd, whose parents met while working in one of the many small oyster houses that dotted the Northern Neck coastline, are two of the top shuckers in the world, each capable of deftly opening two dozen oysters in less than three minutes. Though the oyster industry has declined since the mid-1990s, shucking remains a highly competitive sport. Deborah and Clementine have each won the prestigious Virginia Oyster Shucking Competition, held annually at the Urbanna Oyster Festival, and the National Oyster Shucking Championship in St. Mary’s County, Maryland, where they earned the right to compete in the International Oyster Opening Championship in Galway, Ireland. The two sisters have battled it out in six epic contests on the Virginia Folklife Stage at the Richmond Folk Festival, with Clementine pulling off the upset in the first match, Deborah taking the next three, and Clementine winning the next two. Known as “Fried Apple Pies,” “Dried Apple Pies,” or even “Fried Dried Apple Pies,” these locally made pies seem to have a ubiquitous presence throughout Southwest Virginia, appearing on the counters and shelves of country stores, gas stations, and community festivals. The defining characteristic of the pie is its intense flavor, accomplished through the use of dried apples rehydrated through a long simmering process with brown sugar. While each community likely stakes a claim for one of its local pie makers, Frances Davis, of Rocky Mount, takes the title as the ultimate “Fried Apple Pie Lady.” Her delicious fried-dough pies have been featured at festivals around the state, including the National Folk Festival.